With a sandy beach within paces and gorgeous sea views from the living room and balcony, Ocean Blue in Porthtowan is perfect for families and couples seeking a beachside retreat. Set amidst this coastal hot-spot in a vibrant village community, there are foodie pubs, a delicious deli cafe, the famed Blue Bar cafe/restaurant and a little supermarket all within a few minutes walk. Porthtowan Beach is ideal for play, picnics and swimming, with surf school, boards and wetsuits for hire and seasonal lifeguard patrol. Ramblers will enjoy the scenic delights along the coastal footpath. There are so many beautiful beaches to discover along the north Atlantic coast. Trevaunance Cove at St Agnes is a worthy walk; reward yourself with a real ale and hearty grub from the famed Driftwood Spars inn. Maritime favourite Falmouth on the south coast is reached within a half hour drive. Peruse the harbour, choice of beaches, museum, eateries for all appetites and galleries lining the charismatic lanes. Ocean Blue offers welcoming, comfy and contemporary-styled accommodation, nestled within a small development of apartments almost on the beach. Taking advantage of its first floor position, there are glorious elevated views towards the ocean and lush countryside. The interior is fresh and homely with an open-plan living room with dining area and kitchen, with patio doors to the sunny balcony. Enjoy breakfast, lunch or dinner at the bijou table and bench in the Cornish air. There are two serene bedrooms, one with double bed and the other with double lower bunk and single upper for couples and children. Restful sleep is a given after a soak in the bathroom with TV. 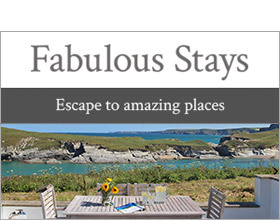 What more do you need from a beside-the-sea bolthole? Al on the First Floor. Two bedrooms: 1 x double, 1 x 2 4' Double lower bunk and Single upper bunk. Bathroom: bath with shower over, Separate Shower, basin, WC, TV. Open plan living room with kitchen and dining area: TV, DVD and iPod. Note: Ten external steps up to first floor.